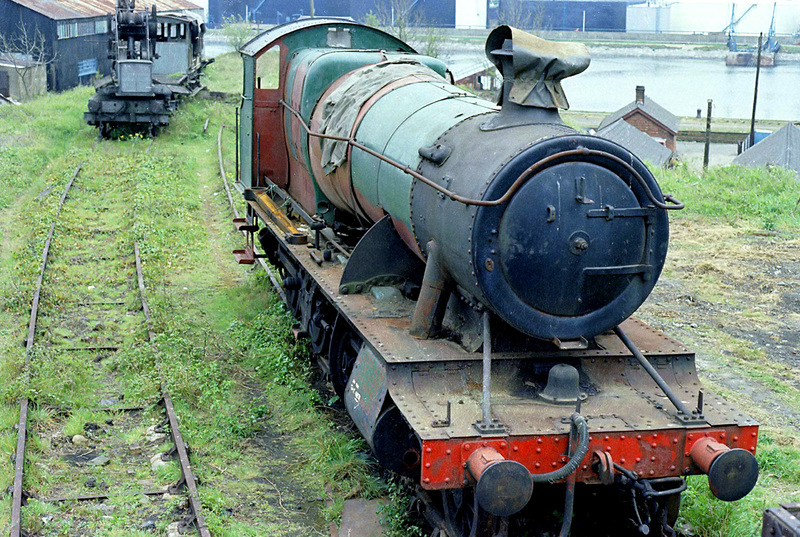 This was my second visit to the famous yard and what was so surprising was the amount of fittings and large pieces that had been removed from the engines in the six years since my first visit.By now the preservation movement was very active and already over 50 engines had left going to restoration sites all over the country.By now I had acquired a Pentax spotmatic SLR so picture quality was up but regretfully all pictures taken on this occasion are rather dull. Two LMS Jubilee's ended up in Woodhams Yard.The other one 45690 'Leander' left in 1972.This one 45699 'Galatea' due to the 'gas axed' centre driving wheels was regarded at that time as unrestorable but was purchased in 1980 as a source of spares for 45690.However after the famous restorations on 71000 and the King 6023 it was decided eventually to restore it.As of 2012 over 30 years later this loco has become something of an enigma. 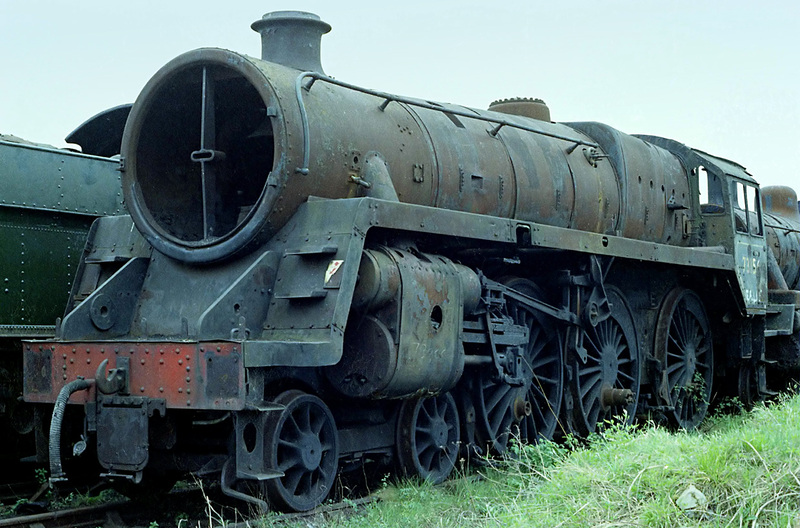 No pictures or news about its restoration have been made public for years although it is known that work is slowly proceeding.It is owned by the same gentleman that owns several other well known restored ex-LMS engines, however this one remains on an extreemly low profile. 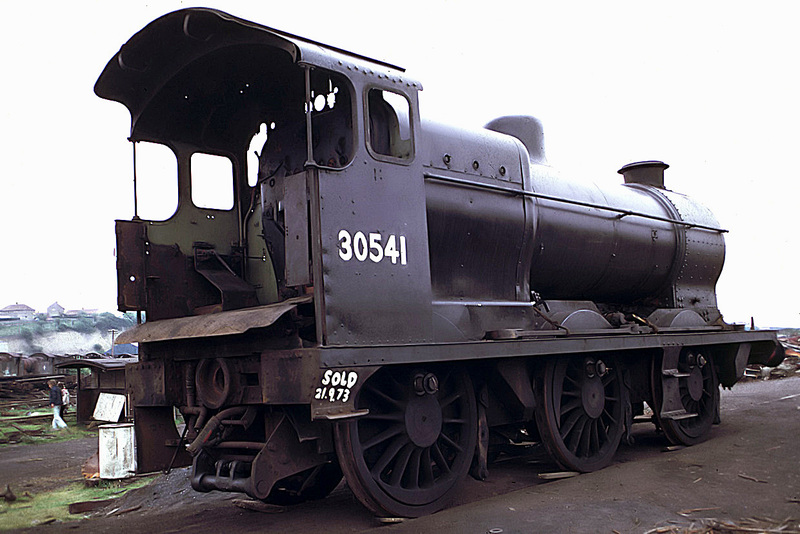 A relatively new engine compared to 'some' in the yard.41312 was built in 1952 and worked to just 15 years ending its day on ECS work out of London-Waterloo.It was withdrawn on the last day of steam on the region. 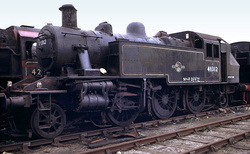 Curiously this engine worked its whole life on the Southern.The engine now works on the Mid-Hants Railway fittingly in the SR area. 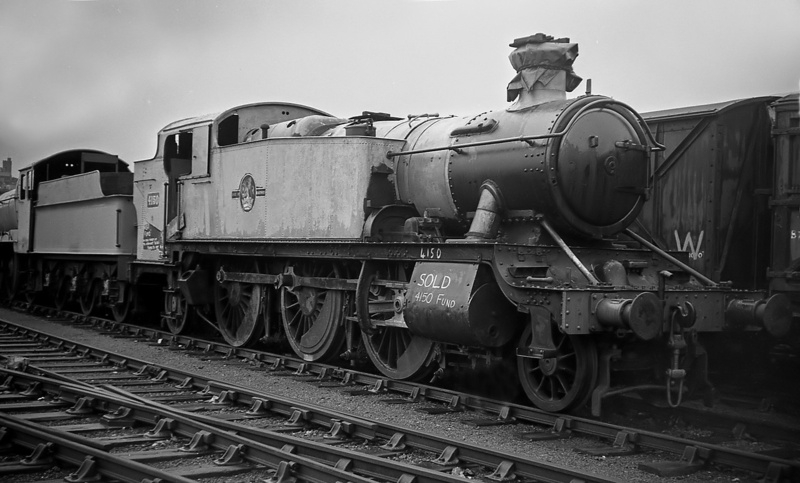 Willington Hall 7927 is a GWR Modified Hall type that was actually constructed in 1950 so strictly speaking is not a GWR engine! 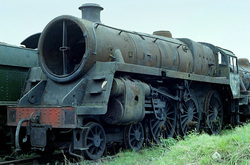 Not that it matters much as this was one of the 'Barry 10' unwanted leftovers that never actually left for preservation in one piece with a promise of restoration and steaming again.This one is to be broken up as spares.The frames going towards the recreation of the now extinct 4-6-0 'County Class' and the boiler is to become part of the 'Betton Grange' 6880 project,another GWR type that were all scrapped. 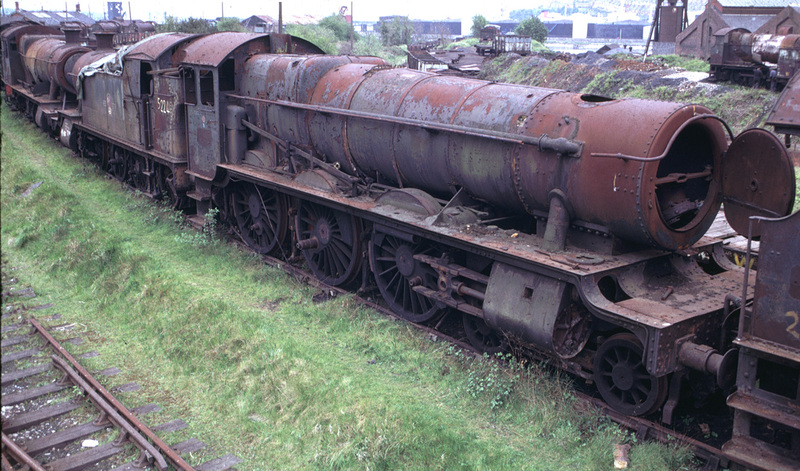 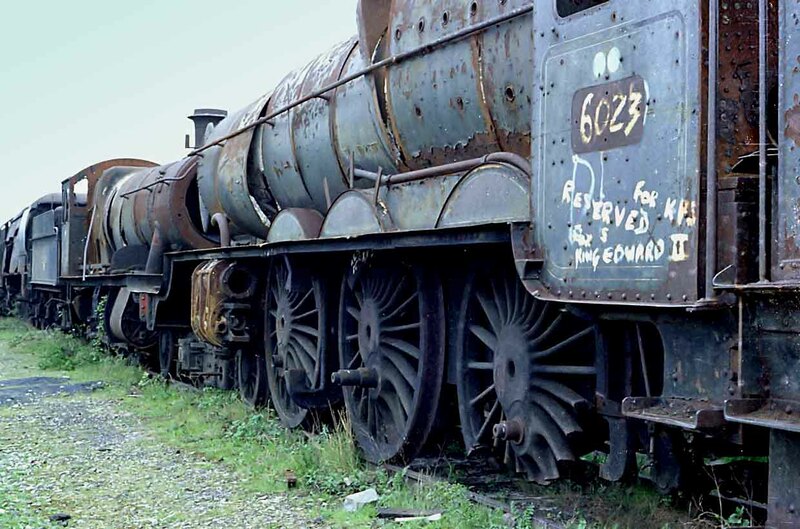 At least it will not die in vain.Locomotive is seen standing in the Barry Island Scrapyard 'departure' area seemingly purchased in October 1973..Obviously that deal feel through. Another sole survivor of an entire class was this one,'Q' class 0-6-0 30541(BR number) built by Maunsell for the Southern-railway in 1939.It spent 10 years in Barry before being removed for restoration,originally at Ashchurch and then to its current home,the Bluebell Railway.Complete with all coupling-rods and most of its fittings this was one of the easier 'Woodhams Hulks' to restore.Loco shown on the departure pad ready for removal from the yard within the next few days. 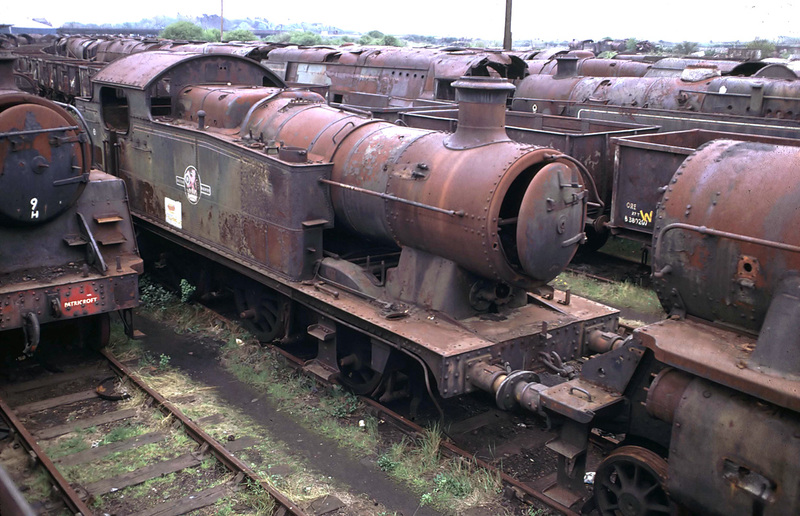 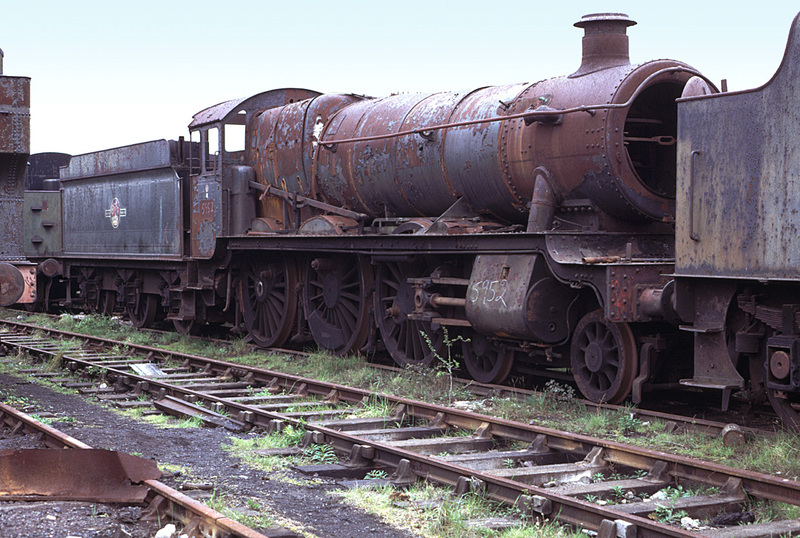 4-6-0 Class B1 61264 was the only Ex-LNER engine to actually end up in the famed scrapyard here at Barry.Introduced into service in December 1947 it just qualified as a genuine LNER engine.Nationalisation happened just a month later on 01/01/1948.Initially removed from service in 1965 it then served as a stationary boiler as Departmental No 29 until it was laid aside in July 1967.Somehow it ended up in S-Wales shortly afterwards. 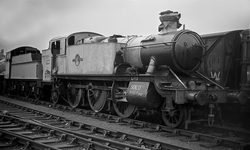 It remaining there until bought and moved to the GCR in July 1976.Due to its use as a stationary boiler the boiler was badly damaged and a lot of specialist work was necessary before it was fit for use again.20 years later in 1997 the engine finally worked in steam again.Now in 2012 is in the middle of a further extensive rebuild.Nothing stays in full working order on steam engines for more than 10 years! 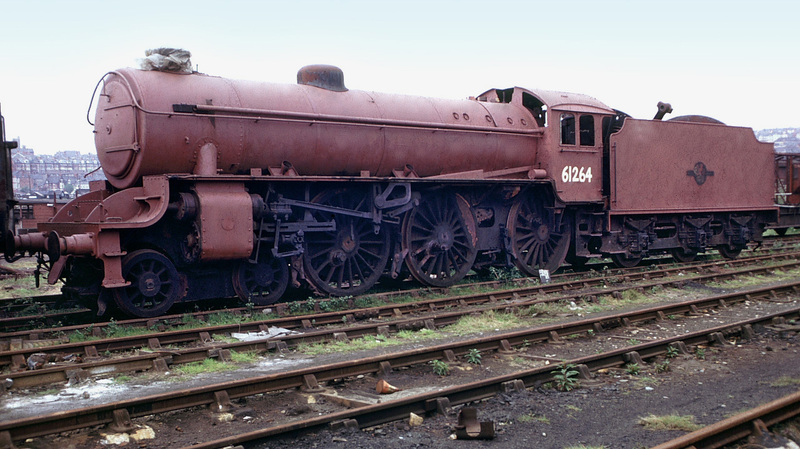 Another view of the only example of an LNER design to come to Barry and survive.61264 looking reasonably complete.Note the connecting rods thoughtfully placed in the tender coal space! 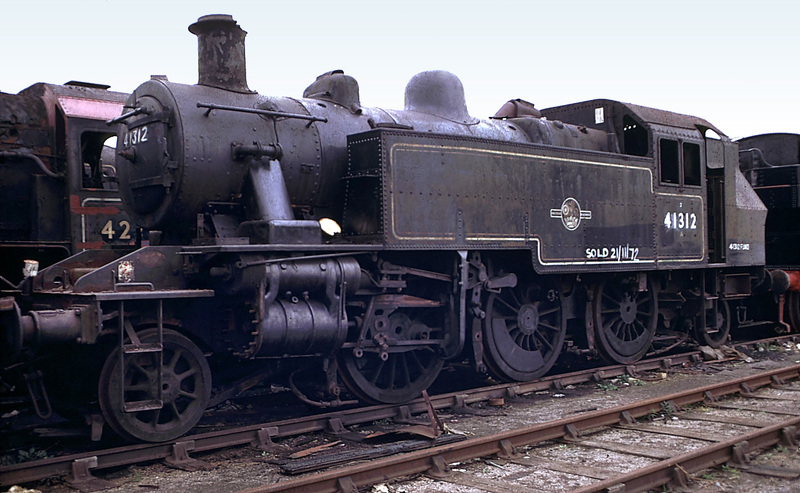 For a more detailed history of this Class B1 4-6-0 click HERE. 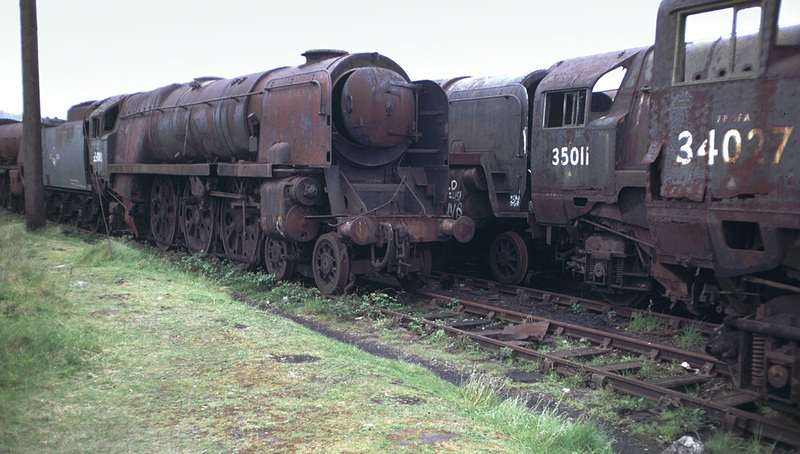 Its an amazing fact that of the 18 WC/BB and 10 MN Class Southern Pacifics that ended up in Barry none were scrapped.Some have been more fortunate than others though.34027 'Taw Valley' has been rebuilt and has been used on the mainline.35011 is in the middle of a long restoration at Sellindge in Kent and 35018 is still basically in scrapyard condition 38 years after this picture was taken. 'Blue Star' 35010 was withdrawn in Sept 1966 due to a damaged n/s cylinder chest caused by priming.Was bought and moved from Barry in January 1985 after a stay of nearly 20 years.Now at the Colne Valley Railway but to date little work has been done to it. 1956 built 73156 actually managed less than 9 years in active service! Withdrawn in 1967 and coming to Barry in early 1968.Eventually as number 177 to leave it went to the East Lancs Railway in 1986.Loco is now well on the way to full restoration that has included the manufacuring of a new tender plus many other 'robbed' components.Now located at the GCR at Loughborough in 2012.....9 years in service/45 years since! The view from the cab of an S15 Southern 4-6-0 sitting in the top-yard at Barry.To the left are some of the many wagons that Woodhams scrapped and it is these that kept the workers busy enough not to have to cut up the locomotives. 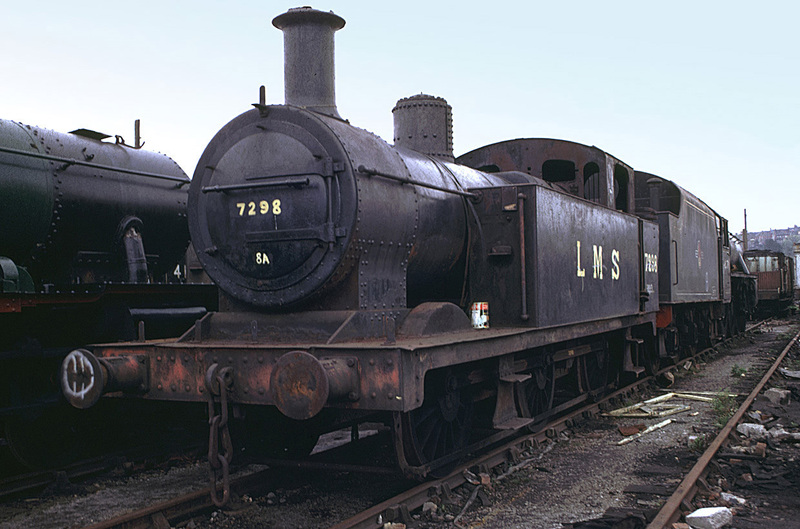 Another view of 42765 patiently waiting to be extracted from the Graveyard.$ years on it left and is now a working engine again.Actually about to return for the 2nd time from an overhaul,this time in LMS-Red as '2765'. 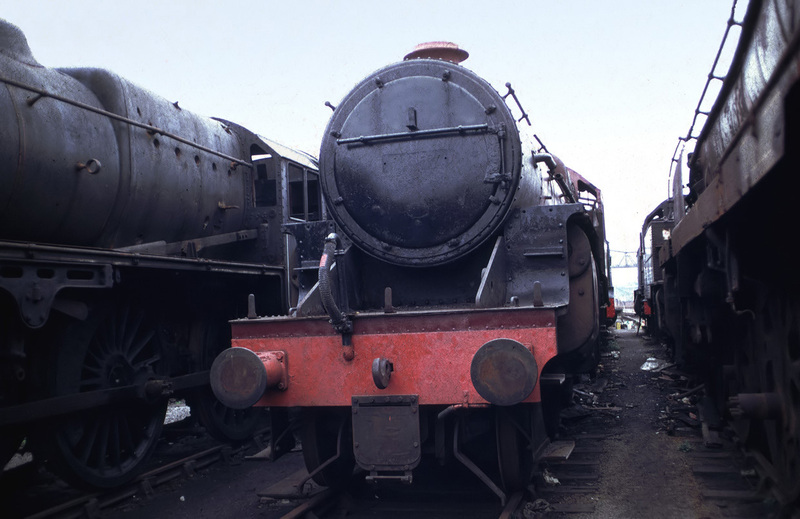 'Shaw Savill' 35009 stands alongside 'Crab' 42765 and an unidentified Black-5 waiting for rescue.42765 left in April 1978 and was back in service on the East-Lancs-Railway by 1993.35009 remains a kit of parts also on the ELR at Bury but in 2012 work has commenced on its rebuild. GWR Large-Prairie 4150 nicely painted up ready to leave the yard.This it did later in the month going initially to the Dean Forest Railway.Now at the Severn Valley Railway where in 2012 work is still actively proceeding to bring it back to life. 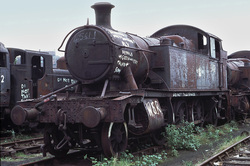 GWR 2-6-2T 4150 stands in the departure area at Woodhams Scrapyard in Barry S-Wales. 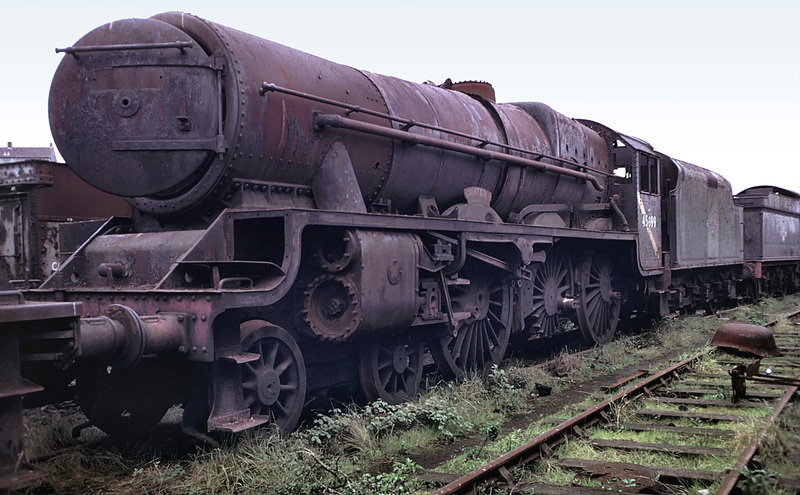 Within a few weeks it was to depart into presevation eventually ending up on the SVR in the Midlands.In 2013 39 years later the restoration goes on! 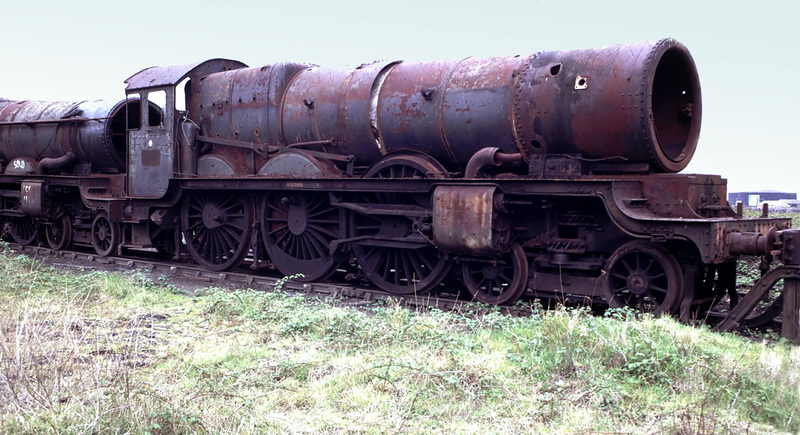 GWR 0-6-2T 6634 still looking pretty complete after 10 years in the yard.The copper-cap still in place on its chimney! 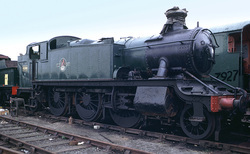 Vestiges of green paint can also be seen indicating this loco was used quite extensively in the Welsh-Valleys on passenger duties.This engine left Barry in 1981 and went to Cranmore on the East-Somerset Railway.Now owned by Pete Waterman it is at the Severn-Valley Railway and due to return to steam in 2012. 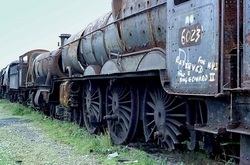 'Cogan Hall' 5952 waits in line.Its turn to leave came seven years later in 1981 when it became the 136th loco to depart.Not restored even now in 2012,in fact its tender and front bogie are to be used in the 6880 'Betton Grange' project but 5952 will be restored eventually! 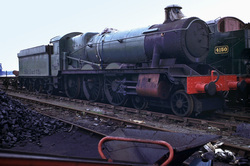 0-6-2 Valley Tank possibly 5637 though it could be 5668/6619/6686 or 6695 stands still pretty much complete waiting for rescue.The green livery hints that this one was probably used in the Welsh-Valleys on passenger duties. 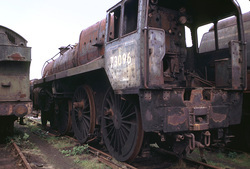 Engine number-164 to depart Barry's famous yard was this one 73096.After barely 12 years service was consigned for scrap and eventually ended up here in Feb-1968.It finally left in 1985 entering preservation at the Mid-Hants Railway where it received a full overhaul and gained a Mainline Certificate as testement to the quality of the rebuild. 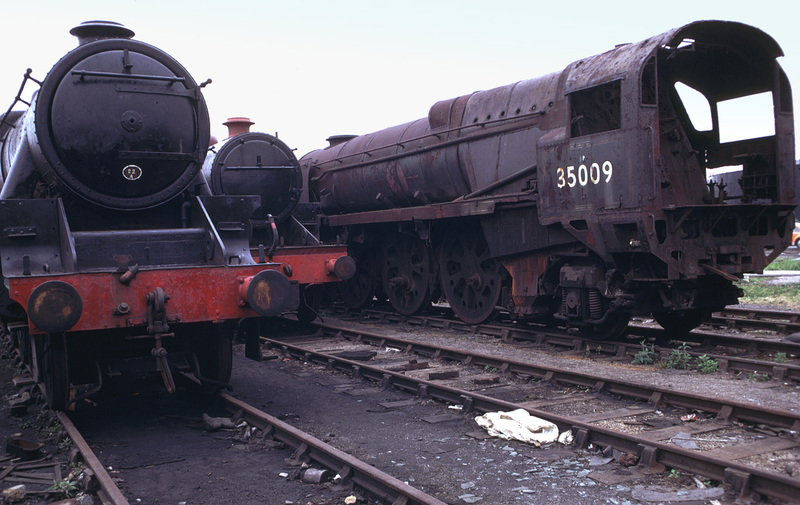 Now active on the mainline in 2011,things were a little different 37 years ago.Here is 5029 'Nunney Castle with 5080 'Defiant' sitting in Woodham's waiting for rescue,heavily stripped perhaps by perspective owners or just robbed for spares by other 'Castle' owners. 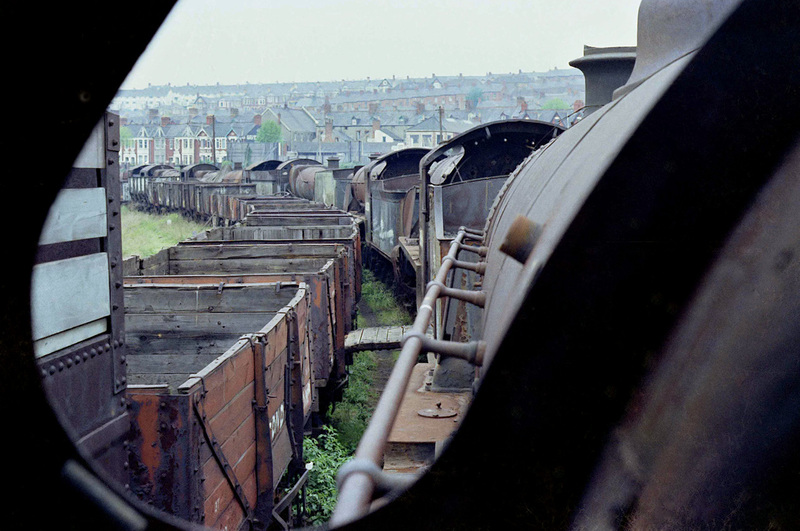 .. Spring 1974..
Tenderless 5967 butts up against 5224 in the top-yard of Woodhams-Yard.As one of the last engines (187th) to leave Barry in August 1987 a lot of work will be needed to rebuild it.Work still proceeding in 2012 at the Northampton & Lamport Railway where it is now based. 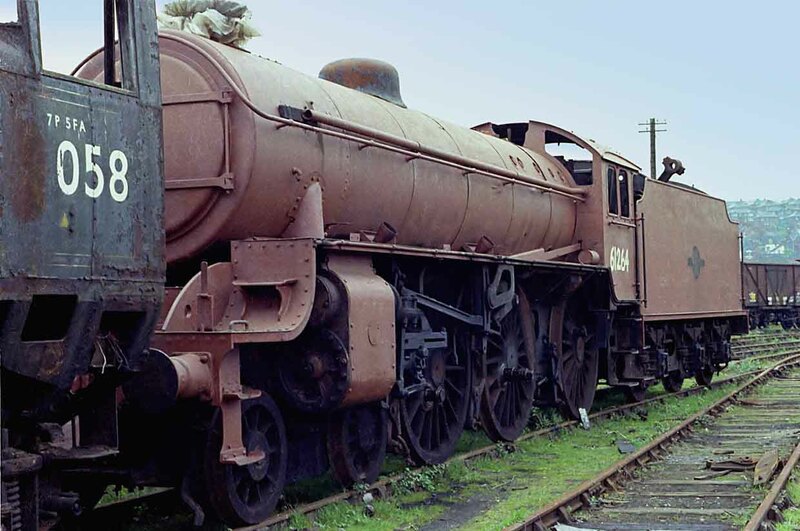 Jinty 47298 only spent seven years at the seaside.After reaching Barry in 1967 was taken to Southport and restored within 5 years.Currently at Llangollen suffering the indignity of wearing the blue livery and number 1 pretending to be Thomas the Tank Engine......Well it pays the Bills? 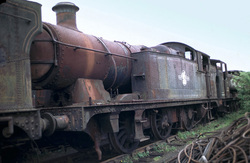 Now a stalwart on the Severn-Valley Railway 2857 sits in the Top-Yard at Barry showing signs of preliminary preservation against the salty air here by the seaside.Eventually departed about a year later in August 1975 after a relatively brief stay of just 12 years.Five more were to see her steam again in 1980 and 30 years on has just been fully overhauled again for another stint on the same railway. 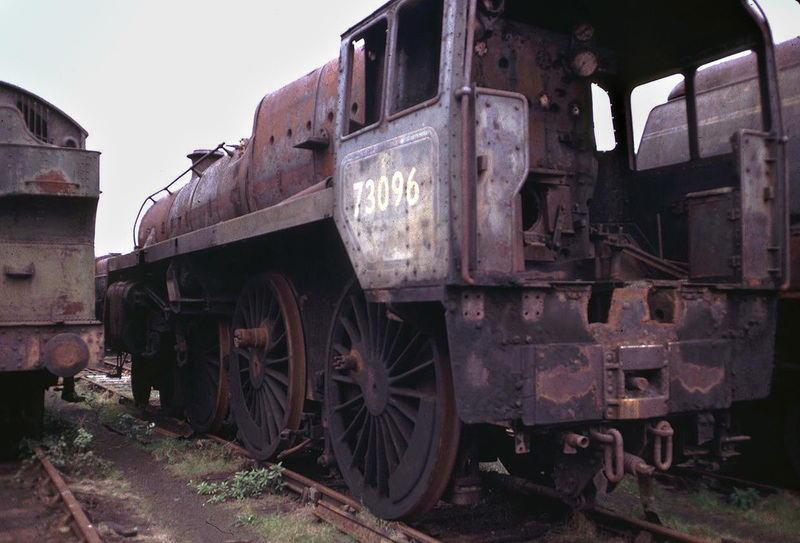 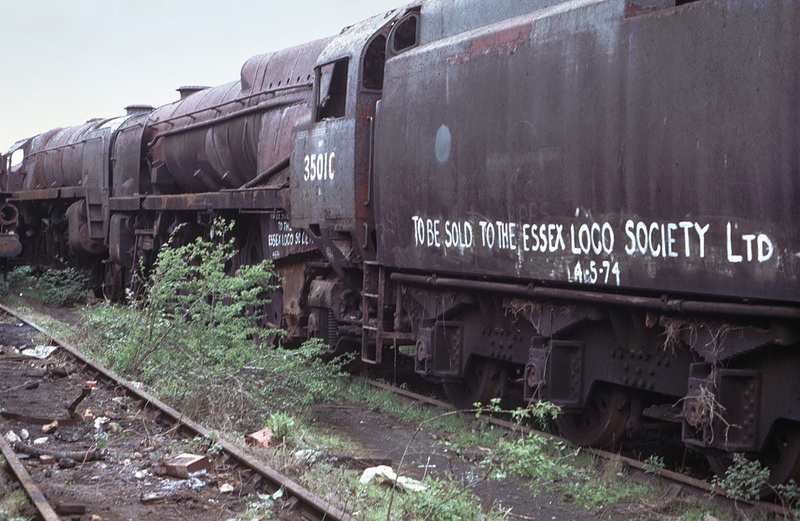 ..Spring 1974..
'The one that got away'--------92085 achieved fame for all the wrong reasons in July 1980 when due to a lull in wagons coming into the yards for scrapping Mr Woodham chopped a couple of the long term resident engines there. 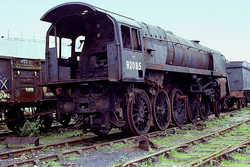 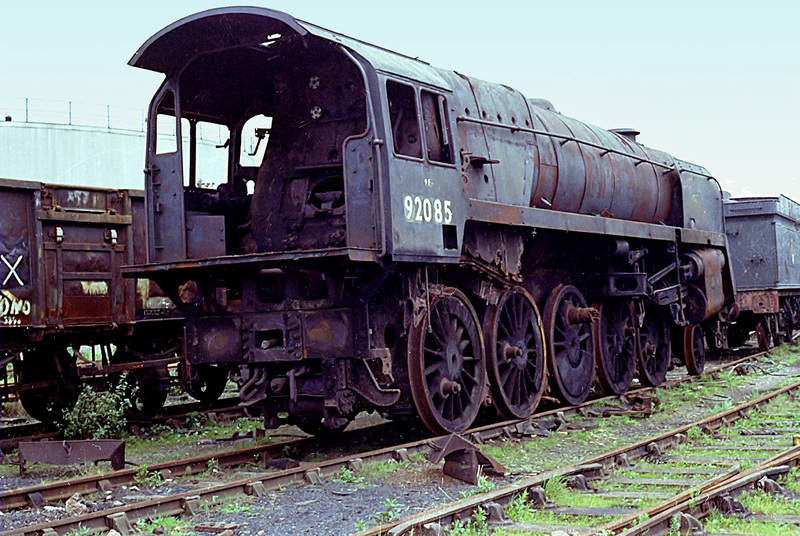 Shortly after this engine was cut-up the supply of wagons for scrap resumed and no more engines were dismantled.